Near-field communications  tech for shopping? Check. 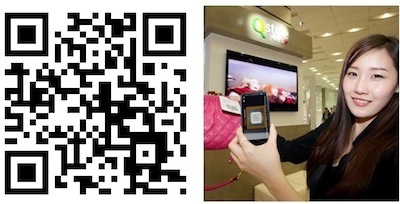 QR codes for smartphone interactivity? Check. Blend of in-store and online purchasing? Check. A South Korean store  is basically previewing how we'll all shop inside five years. The effort is from Korean cell phone operator SK Telecom, and the first Q-Store in Seoul is just one of an entire chain that'll be constructed in the near future. As befits a high-tech sales outfit in a nation where much of the world's high tech is made, the Q-Stores leverage smartphone integration to take the shopping experience into the 21st Century. Each of the 200 or so product lines has a QR code on its shelf price tag, and inside each tag is a hidden NFC data loop. Shoppers browsing the shelves can scan the code with a smartphone or wave their phone over the NFC tag (if they own a Nexus S or one of the handful of other phones that have NFC built in) and the phone will display extra information about the product automatically. If they chose the item, they can buy it conventionally in-store, or choose to buy it online for a saving of 10% to 40%, and even arrange delivery directly inside the phone app. Essentially the Korean phone network is demonstrating some of the big benefits that NFC and smartphone-enabled smart shopping are expected to bring to us all inside a few years. What the Q-Store seems to lack is rich data feedback to the consumer in the form of uploaded apps or price-incentivised advertising, instead seeming to be a kind of hyper-local Augmented Reality system that delivers extra product information. We can, however, imagine that SK Telecom is using the data collected from its customers to inform its stock decisions–for example, if people often browse a particular product in-store but only ever buy it online, then there's less need to keep a stockpile of that item in the store room.